There are no such things as “absolute” human rights. There are only privileges which various societies variously deem to be the rights of their members (and sometimes of their non-members). “Rights” are nothing more than “privileges” granted by a body which claims the authority to grant such privileges. Very often such “rights” are granted even though the body granting the privilege has not the power or capability to ensure the privilege, even where the body is a State and has introduced legislation about it. (I note in passing that no Law of God or Man ensures – or can ensure – compliance with the Law. It is only the Laws of Nature which enjoy 100% compliance and where compliance is inherent within the existence of the Law. Which suggests to me that the Laws of Nature rank higher than the Law of any god or of any man). …. what is it that makes aborting a foetus and preventing a child from being born much less disturbing than terminating the existence of that same child after birth? Whether to have an abortion or not is entirely a matter for the woman concerned – in my opinion. Whether others should assist her or not is a matter for them – in my opinion. But in Sweden where the State has determined that abortion is a “privilege” it has granted under certain circumstances, it has also – to try and ensure compliance – made it a duty and obligatory for health care workers to assist in such abortions. And that impinges on the “rights” of those workers in their choice whether to help or not. The abortion issue can sail up as a conflict area within the conservative Alliance parties. The new Christian Democrat leader Ebba Busch Thor has reiterated the call for a conscience clause. But the proposal was rejected by the Liberal Party leader Jan Björklund. “It is not reasonable. Health care operates under legislation to be able to perform abortions under certain criteria and conditions. Then the staff who are in health care must perform accordingly” says Jan Björklund. The Christian Democrats have long called for the introduction of a conscience clause which would means that midwives who do not want to perform abortions should be able to avoid it. But the previous party leadership with Göran Hägglund at the top, decided not to pursue the matter. Ebba Busch Thor, who yesterday was elected as the new Christian Democrats leader, has in several interviews in recent months raised the conscience clause and she now wants to get the party to run with it. This would then be a change of course for the Christian Democrats. If this is what happens Busch Thor can expect to meet resistance from Alliance colleague Jan Björklund. “For the Liberal Party this is not an issue. We are different parties and of course we have different views on some issues. It’s nothing new. Then if the Christian Democrats intend to pursue this type of question harder, we would of course have discussions in the Alliance” he said. Anna Starbrink, the Liberal Party’s strong woman in Stockholm and responsible for health care is upset. “The woman’s right to abortion must be that which rules. There can be no doubt about it. If a woman seeks an abortion, she should not be questioned and met by staff who refuse to perform their duties. It nibbles the right to abortion at the edges. If it hampers women from getting an abortion, the law would have been sidelined” says Anna Starbrink. In Sweden abortion is available “on demand” upto the 18th week of pregnancy. Between the 18th and 22nd week permission is needed from the National Board of Health and Welfare (Socialstyrelsen). In very special cases, later abortions are permitted if the foetus is not viable. High infant mortality rates plagued communities throughout Europe until the beginning of the twentieth century. Even in the middle of the 1800s, a quarter of all babies born in many European countries died before their first birthday. At the start of the nineteenth century in France, less than one half of children lived to be ten years old. In Sweden as a whole, the infant mortality rate in the late 1700s was about twenty percent. Medical science it would seem has enabled the dramatic reduction in infant mortality and has also enabled an equivalent increase in the number of abortions. After-birth, involuntary termination of life has been replaced by a before-birth, voluntary termination. While it seems logical that every women decide for herself if she wishes to have an abortion or not, it does not seem logical – to me – that others should be forced – coerced by the threat of losing their jobs – to participate in her decision. Does the Swedish “right to have an abortion” override the individual’s “right to have a conscience”? Researchers studied Norwegian church records of 9,000 people from the period 1750-1900 and looked at life history variables and compared them with environmental factors including solar activity. NTNU Press Release: Skjærvø and her colleagues found that children born in the years with lots of solar activity had a higher probability of dying compared to children who were born in the years with less solar activity. On average, the lifespan of children born in years that had a great deal of solar activity was 5.2 years shorter than other children. The largest difference was in the probability of dying during the first two years of life. Children who were born in years with lots of sunshine and who survived were also more likely to have fewer children, who in turn gave birth to fewer children than others. This finding shows that increased UV radiation during years of high solar activity had an effect across generations. Skjærvø used information on the number of sunspots as an indication of the amount of UV radiation in a given year. The number of sunspots reaches a maximum every 11 years on average, which results in more UV radiation on Earth during years with high sunspot and solar activity. UV radiation can have positive effects on human vitamin D levels, but it can also result in a reduction of vitamin B9 (folate). It is known that low folate levels during pregnancy are linked to higher child mortality. The NTNU study showed that families from the lowest socio-economic groups were most affected by UV radiation. This is probably related to the time period Skjærvø studied, which was a time of clear class distinctions in Norway, especially in rural areas. Women who worked in the fields were more exposed to the sun than other women. In many cases they also had a poorer diet. If the primary mechanism for such connections is through UV radiation, then it presumably does not have the same impact on those with darker skin. But I suppose that the records from tropical or equatorial regions are not as comprehensive or reliable as old Norwegian church records. Just over a year ago the average fertility rate in India was 2.5 (where the replenishment level is 2.1) and over half the country was at levels below 2.1. With corresponding declines in infant mortality the projections were for population to reach a peak between 2040 and 2050 and to decline slowly thereafter. But new data for 2013 from the Registrar General shows that fertility is declining faster than expected. The average is already down to 2.3. By 2020 the country as a whole will have an average fertility rate below the 2.1 needed for maintaining a constant population (the replenishment rate). However, infant mortality rate has declined slower than expected. India’s population will therefore likely peak closer to 2040 than 2050. The Hindu: The 2013 data for the Sample Registration Survey (SRS), conducted by the Registrar General of India, the country’s official source of birth and death data, was released on Monday. The SRS shows that the Total Fertility Rate – the average number of children that will be born to a woman during her lifetime – in eight States has fallen below two children per woman, new official data shows. Just nine States – all of them in the north and east, except for Gujarat – haven’t yet reached replacements levels of 2.1, below which populations begin to decline. 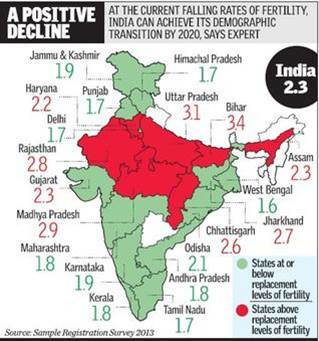 West Bengal now has India’s lowest fertility, with the southern States, Jammu & Kashmir, Punjab and Himachal Pradesh. Among backward States, Odisha too has reduced its fertility to 2.1. “At 2.3, India is now just 0.2 points away from reaching replacement levels. Fertility is declining rapidly, including among the poor and illiterate. At these rates, India will achieve its demographic transition and reach replacement levels as early as 2020 or 2022,” Dr. P. Arokiasamy, a demographer and Professor at the International Institute for Population Sciences (IIPS), Mumbai, explained to The Hindu.